Dehradun is one of the best cities to live in India. The perfect climate with a blend of mountains makes it a place for living in nature. Besides the natural environment, the city is totally free of pollution which most of the city people desire. The city is peaceful as compared to other populated cities and also, surrounded by Mussoorie, Haridwar, Rishikesh. These places are a perfect destination for adventure enthusiast and a lot more. Also, this city is one of the educational hub of India with many reputed colleges and universities. Slowly, the city is developing in terms of the real estate market. Pacific India is the best real estate group of India and is creating a mark in Dehradun by presenting Pacific Golf Estate. Pacific Golf Estate is the new residential project on Sahastradhara road which is both luxurious and natural as it is nested beside the Himalayan mountain range. The project is dispersed over 35 acres of land which comprise 9 holes signature golf course. With the amazing location, connectivity, homes, environment, facilities, and amenities makes this one of the best residential projects in Dehradun. This project is a dream project especially for retired and elderly people who want to dedicate their time with nature and around mountains. If you want to buy a home in Dehradun, then Pacific Golf Estate is the total worth project for you and your family. 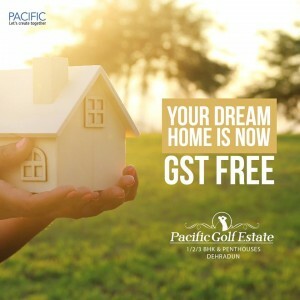 Don’t think about this wonderful opportunity and book your new homes today in Pacific Golf Estate and make the most out of life.